For the month of October, there were 2 homes sold and closed in Eagle Creek. 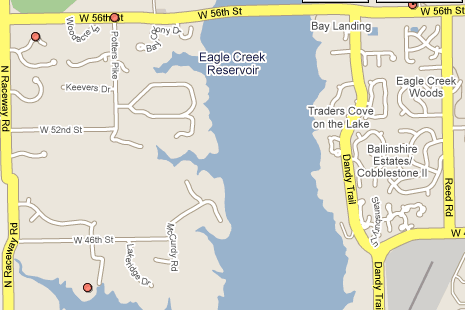 For the purpose of describing properties sold in Eagle Creek, I use two areas. The traditional area of homes and neighborhoods which border the reservoir, as indicated on the map. These include homes and neighborhoods between Reed Road to the east, Raceway Road to the west, 56th Street to the north and south to 42nd Street. The other area, which is generally accepted as Eagle Creek is The Preserves at Eagle Creek, which is located northwest of the reservoir and does not actually border Eagle Creek. There was one home sold in October in The Preserve at Eagle Creek. A five bedroom, five bath home with full basement and 5525 square feet sold for $520,000. The other sold was a condo at Cobblestone; a two bedroom, two bath unit with 1152 square feet sold for $55,000. It was a bank owned property. Statistics were obtained from the Metropolitan Indianapolis Board of Realtors (MIBOR) data and are representative of Indianapolis homes which were sold between 10/1/2008 and 10/31/2008. Available homes were active on 1/28/2009. This data is reflective of homes which were listed on the Indianapolis BLC; private sales are not included. All information is believed to be accurate, but is not guaranteed. Indianapolis Real Estate Blog, written by Paula Henry, an Indianapolis real estate agent and team leader of The Home to Indy Team, serving the Indianapolis and Eagle Creek real estate markets.